A League of Their Own is a 1992 American comedy-drama film that tells a fictionalized account of the real-life All-American Girls Professional Baseball League (AAGPBL). Directed by Penny Marshall, the film stars Tom Hanks, Geena Davis, Madonna and Lori Petty. 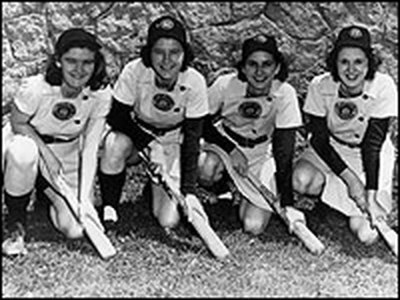 The spring of 1945 found women suiting up in jerseys and skirts for the start of the league's third season When Philip K. Wrigley spearheaded the effort to remedy professional baseball’s wartime decline with a women’s league, one question dogged the league’s founders: what, exactly, to call it. It wasn’t technically softball. The ball was smaller, the bases farther apart and stealing bases—forbidden in softball—was permitted. But it wasn’t baseball, either: the ball was larger and the bases, closer. 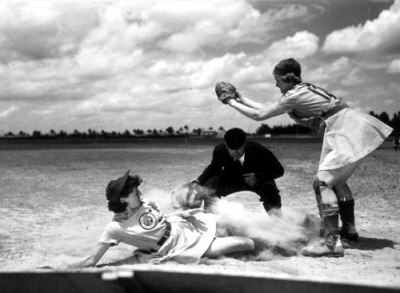 They settled on a compromise: The All-American Girls Professional Ball League. The league that would later inspire the 1992 movie A League of Their Own — and the enduring exclamation, “There’s no crying in baseball!” — Had just kicked off its third season when LIFE featured it in a photo essay in 1945. The six teams, all based in the Midwest, were comprised of nearly 100 women between the ages of 16 and 27 who played for $50 to $85 per week. Eight were married and three had children. Nearly half a million spectators were expected to turn out over the course of that season, shelling out $0.74 for a seat to watch the Rockford Peaches face the South Bend Blue Sox and the Grand Rapid Chicks take on the Racine Belles. As exciting as it was to watch women slide and steal and scuff their knees, the league was a product of its time, and its strict rules of conduct reflected this. 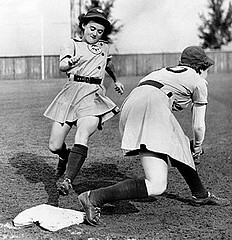 According to LIFE, “League rules establish she must always wear feminine attire, cannot smoke or drink in public, cannot have dates except with ‘old friends’ and then only with the approval of the ever-present team chaperone.” But as demure as the players may have been off the field, they were serious athletes as soon as the first pitch was thrown. 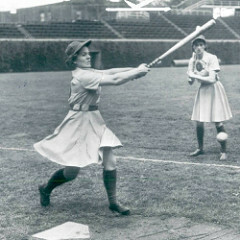 Blue Sox Catcher Mary “Bonnie” Baker could throw 345 feet. Lefty pitcher Annabelle Lee threw a perfect game. And Sophie Kurys stole 1,114 bases during her ten-year career. The appeal of players’ athleticism kept the league going for more than a decade, with attendance peaking in the late 1940s at 910,000 fans. But the league’s decentralization, a dearth of qualified players and the rise of televised major league games eventually led to its demise, with players retiring their gloves after the close of the 1954 season.